Published in TomDispatch, Mother Jones, Salon, and Grist. 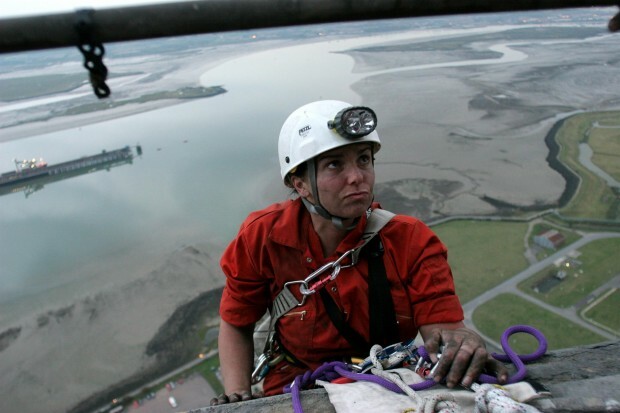 In the early morning of October 8, 2007, a small group of British Greenpeace activists slipped inside a hulking smokestack that towers more than 600 feet above a coal-fired power plant in Kent, England. While other activists cut electricity on the plant’s grounds, they prepared to climb the interior of the structure to its top, rappel down its outside, and paint in block letters a demand that Prime Minister Gordon Brown put an end to plants like the Kingsnorth facility, which releases nearly 20,000 tons of carbon dioxide into the atmosphere each day. In the end, the fatigued, soot-covered climbers were only able to paint the word “Gordon” on the chimney before, facing dizzying heights, police helicopters, and a high court injunction, they were compelled to abandon the attempt and submit to arrest. They could hardly have known then that their botched attempt at signage would help transform British debate about fossil-fuel power plants — and that it would send tremors through an emerging global movement determined to use direct action to combat the depredations of climate change. The case took on historic weight only after the Kingsnorth Six went to court, where they presented to a jury what is known in the United States as a “necessity” defense. This defense applies to situations in which a person violates a law to prevent a greater, imminent harm from occurring: for example, when someone breaks down a door to put out a fire in a burning building. In the Kingsnorth case, world-renowned climate scientist James Hansen, director of the NASA Goddard Institute for Space Studies, flew to England to testify. According to the Guardian, he presented evidence that the Kingsnorth plant alone could be expected to cause sufficient global warming to prompt “the extinction of 400 species over its lifetime.” Citing a British government study showing that each ton of released carbon dioxide incurs $85 in future climate-change costs, the activists contended that shutting the plant down for the day had prevented $1.6 million in damages — a far greater harm to society than any rendered by their paint — and that their transgressions should therefore be excused. The idea that now is the right time for more resolute action to address the climate crisis is spreading fast enough to dot the global map with hot spots of disobedience. As it turns out, the Kingsnorth Six are part of a rapidly growing population. Joining them are the Dominion 11, arrested after forming a human blockade to stop the construction of a coal plant in Wise County, Virginia, in November 2008, and the Drax 29, who went on trial this summer for boarding and stopping a train delivering coal to a power plant in North Yorkshire, England, last year. In August 2007, Al Gore, Nobel-prize-winning author of An Inconvenient Truth, told Nicholas Kristof of the New York Times, “I can’t understand why there aren’t rings of young people blocking bulldozers and preventing them from constructing coal-fired power plants.” By the time Gore made that statement, some young people had already started blocking bulldozers, and many more, young and old, would soon follow. Still, Gore can be excused for feeling that such measures were overdue. With global warming, perhaps more than any other issue, there is a disjuncture between a widespread acknowledgment of the gravity of the situation we face and a social willingness to respond in any proportionate way. The landmark 2007 report from the Intergovernmental Panel on Climate Change (IPCC) suggested that a two degree Celsius rise in average temperature, likely by 2050, would create severe water shortages for as many as two billion people and place between 20% to 30% of all plant and animal species at risk of extinction. It gets worse from there. An April 2009 Guardian poll reported: “Almost nine out of 10 climate scientists do not believe political efforts to restrict global warming to 2C will succeed.” More probable, they believe, is “an average rise of 4-5C by the end of this century,” a level that could create hundreds of millions of refugees fleeing areas afflicted by desertification, depleted food supplies, or coastal flooding. That these consensus predictions may feel remote and improbable to much of the American public does not reflect a real scientific debate, but rather a common reluctance to face unpleasant facts — and also the considerable success of the coal and oil lobbies in dampening the electorate’s sense of urgency about the issue. Those two realities are precisely what direct action intends to confront. When Vice President Gore started endorsing civil disobedience, Abigail Singer, an activist with Rising Tide, a leading network of grassroots climate groups, noted, “It’d be more powerful if he put his body where his mouth is.” She had a point. As it happens, 68-year-old James Hansen, arguably the most famous climate scientist alive, has been less reticent about putting himself on the line. His involvement has furnished a great deal of mainstream respectability to those turning to more confrontational means of expressing dissent, and the trajectory of his political engagement catches an important trend. Throughout the 1980s and 1990s, Hansen published many groundbreaking papers demonstrating the reality of a warming planet. Just as the work scientists had done in the early 1980s proving that human activity was creating a hole in the ozone layer had resulted in a 1987 treaty against chlorofluorocarbons, Hansen assumed that the work of those documenting climate change would result in swift legislative remedy. “He’s very patient,” Hansen’s wife Anniek told Elizabeth Kolbert of the New Yorker. “And he just kept on working and publishing, thinking that someone would do something.” This time around, however, industrial interests proved far more entrenched. In order to help move glacially slow climate negotiations forward, Hansen started speaking out and, more recently, has begun risking arrest at demonstrations. Sadly, the latent hope that politicians will eventually come to their senses cannot suffice as a political strategy. The stark facts of segregation in the American South never put an end to that longstanding injustice; it took an unruly civil rights movement to force change. In this case, presumably less farsighted and more profit-hungry energy companies than the climate-concerned E.On have invested tens of millions of dollars in convincing elected officials and newspaper editorial boards that reducing emissions of greenhouse gases is neither practical nor particularly needed. The operative force at work here is not stupidity, but political power. Hansen and others motivated to confront the industry head on have concluded that, unless there is a public counterbalance to the organized money of those who profit from the status quo, what science has to say will be largely irrelevant, no matter how theoretically convincing it may be. Unless citizens themselves become inconvenient, the truth will remain a minor consideration. It is no accident that, on June 23rd, when Hansen was arrested for his first time, it was in West Virginia, the heart of coal country. Because coal is the largest single source of greenhouse gas emissions both in the United States and worldwide, and because there is enough coal left in the ground to heat the planet to catastrophic levels, that fossil fuel has been the focus of much new protest. As long as U.S. and European power plants continue spewing coal smoke, their governments will have absolutely no credibility in trying to influence the policies of rising economies such as China and India. Nonetheless, current U.S. legislation ensures that coal burning will continue largely unchecked for decades to come. “You stand at the edge of one of these mountaintop removal sites and you’ll never feel the same way again,” says Mat Louis-Rosenberg, a staffer at Coal River Mountain Watch in southern West Virginia. The practice turns rolling mountains and valleys into flat, desolate moonscapes. Locals regularly hear the blasts of surface mines from their homes and then drink the resulting contaminants in their well water. When newly created lakes of toxic coal waste give way — as happened last December as a billion gallons of sludge flooded 300 acres of land near Harriman, Tennessee — they are the ones whose homes stand immediately downstream. When the Kingsnorth decision was announced, an E.On representative said the company was “worried that this ruling will encourage other protestors to engage in similar actions at power plants across the country.” The worry was justified. The diverse local protests taking place internationally are starting to feel like part of something larger, especially since they are already beginning to have an impact. Of the 214 new coal plants proposed in the United States since the year 2000, more than half have been cancelled, abandoned, or put on hold. The website Coal Moratorium Now, which tracks public campaigns, shows that citizen dissent played a critical role in many of the cancellations or delays. Other results have been less obvious but no less real. Facing greater resistance, and the prospect of costly public relations battles, power companies are simply proposing to build fewer coal plants than was once the case. Environmental organizers are planning for still larger mobilizations. In March, hundreds of people, including Hansen and 350.org campaign organizer Bill McKibben, joined in human chains to block the entrances to a target of enticing symbolic importance: Washington, D.C.’s Capitol Power Plant, a coal-burning facility built in 1910 that provides steam and refrigeration power to Capitol Hill. Police avoided making arrests, which could have easily exceeded highs for any previous act of civil disobedience around climate issues in American history. Nonetheless, the gathering produced a desired effect: House Speaker Nancy Pelosi and Senate Majority Leader Harry Reid sent a letter to Acting Architect of the Capitol Stephen Ayers requesting that the plant switch to natural gas. On a global level, activists are starting to envision an international day of action that might launch disparate local campaigns into the mainstream spotlight and create a more unified global movement. A buzz of expectation and organizing now surrounds a December U.N. climate conference in Copenhagen, Denmark, where environmental ministers and other officials will gather to create a new treaty to replace the Kyoto protocol. The conference is taking place almost exactly 10 years after the 1999 Seattle protests which overwhelmed the ministerial meetings of the World Trade Organization and altered the shape of globalization debates for years after. Hopes for recreating an event of that magnitude are based on more than just a coincidental anniversary year. Before Seattle, localized activity by global justice advocates had similarly swelled — with a wave of student anti-sweatshop drives, environmental boot camps, organic food gatherings, corporate ad spoofs, indigenous rights battles, and cross-border labor campaigns already simmering. Seattle united these into a recognized “movement of movements” more potent than the sum of its parts. Organizers have suggested that as many as 100,000 people might take to the streets in Copenhagen. Among those planning around the Denmark conference, there is currently a debate about whether to converge on the conference itself or to target a heavily polluting company somewhere nearby as an example of bad climate-change behavior. Likewise, in the United States, where events will be timed to take place in solidarity with the demonstrations in Copenhagen, there is a debate about whether to try to work with the Obama administration or turn up the heat on it. In the end, a range of tactics will no doubt be deployed in Copenhagen and in other cities around the world. A coalition of groups, including the normally satiric Yes Men, is managing a site called BeyondTalk.net, which allows people to sign a pledge expressing their willingness to join in nonviolent civil disobedience as the conference date nears. As of this writing, 3,210 people have signed on. Compared with the numbers of people who will ultimately have to be persuaded of the need to act in order to force meaningful solutions to climate change, that remains a modest tally. In terms of the growing levels of dedication and personal sacrifice it represents, its significance is far greater. After all, that’s more than 3,000 people willing to take the chance that a determined action, even a botched one, might ultimately reverberate far and wide. It’s more than 3,000 people who may just be willing to climb for hours through a huge radiator in order to stop the planet from becoming one in all too short a time. Research assistance for this article provided by Sean Nortz. Photo credit: Greenpeace UK.